We are lazy. It's another chilly, blustery day outside ... a day we have resorted to staying in for, even though we are in need of a grocery store trip. I know I just tried the delivery service deal and there are aspects of it I do like; but apparently they don't offer a '30 minutes or less' delivery service. Huh. So once again, it's dinner via the cupboard leftovers and outcasts. Can't go wrong with a soup; but with the new year the goal is lighter cooking for a while. 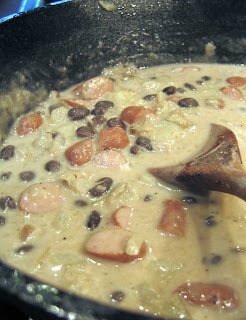 A can of black beans, some potatoes and some really random meat - Little Smoky Sausages to be exact - and presto, you've got soup. Keep in mind you could use any meat here (bacon of course would be my first choice) or you could skip the meat and go for a vegetarian potato soup, too. To keep the calories down I went with more broth and just a hint of cream to thicken (skipping the flour), and I kept the cheese down to a manageable amount rather than go overboard. Keep in mind that I used what I had in the house, so if you have a different cheese or different potatoes than I used, just use what you have. This was the first time we tried out the new cast iron pot Dave's folks got us for Christmas- it worked great- thanks! I wonder if I would be a better or worse cook if I spent more time actually planning meals and shopping for ingredients rather than continually making up ideas out of what's left in the house? We'll probably never know. And right now- I've got a warm, thick, creamy soup in my midst and I don't care. I'm fat and happy! Continue to simmer until the potatoes are tender and the flavors have melded. 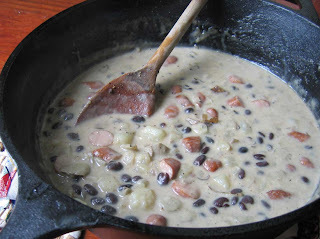 (Try mushing some of the potatoes with the back of the spoon to help thicken the soup.) Expect to let this soup simmer for around 1/2 hour. The heat of the soup will melt the cheese and thicken the soup., but leave the heat off as you don't want the cheese to burn on the bottom of the pan. Salt and pepper to taste. **for a little spicy twist, I added one tsp of green curry (just out of a can) to a left over bowl of this soup I was warming up and it was real fun kick! Be careful though- that green curry can be some hot stuff! Hi Marla! This is a pretty small batch, 4 big servings is about what we got out of it. If you like spicy and don't have green curry on hand, add in a little chopped jalepeno with the onions, or some ground red pepper for a kick! Let me know how it works out! This sounds fabulous! I can't wait to give it a try!